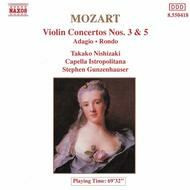 Mozart: Violin Concertos Nos. 3 and 5 composed by Wolfgang Amadeus Mozart (1756-1791). Naxos Classics. Concerto. Listening CD. Published by Naxos (NX.8550418).ISBN 4891030504189. Concerto.Release date: 12/29/90.About Listening CDsListening CDs are traditional music recordings. Listening CDs make a great educational supplement - hear exceptional professionals play the music you're learning! Or, just enjoy listening to the music you love.